In Pakistan, Act Member CWSA is using a Mobile Knowledge Resource Center equipped in a truck to bring DRR education to remote, hazard-prone communities and help community members, teachers and school children to prepare for the event of a natural disaster. In Ethiopia, indigenous early warning knowledge and practices are documented, shared and combined with modern technology to strengthen and promote decentralized early warning and response systems by ACT member ICCO. This improves early warnings and increases the trust of communities in the information. 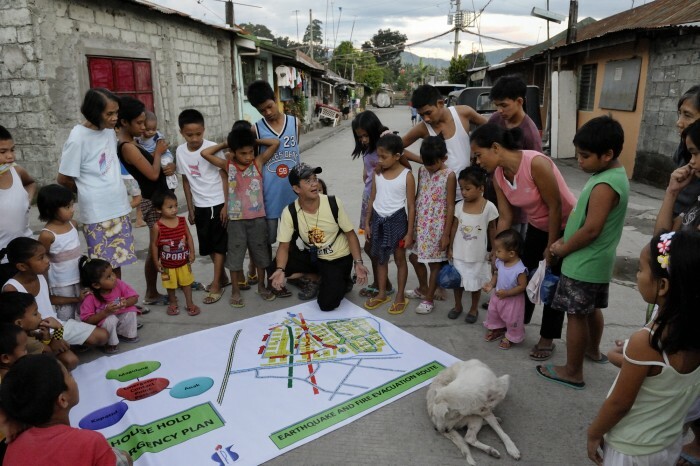 Communities are taking action to avoid or reduce disaster risks. In Myanmar, Village DDR Committees mobilise community and government resources to strengthen village infrastructure with support from ACT Member Diakonia. In Indonesia, we invented a climate field school run by an ACT partner BfW, which demonstrates growing rice on bamboo rafts floating on the water, an innovation developed by the community. The 2 x 5 meter rafts can be made within half an hour, usually from bamboo trunks held together with netting. The cost of 3.80 euros is moderate and over a three year period, the rafts save a lot of money. ACT Alliance is fully committed to reducing disaster risks in addition to responding to humanitarian crises through our presence deeply rooted in the societies in over 100 countries. We enable local capabilities for ‘Preventing and Mitigating Disaster Risks’ before, during and after disasters.